As is inevitable for someone who died 38 years ago, there's not as much flawless Jimi Hendrix footage out there as we'd like. But there are some stunning/weird clips you should see. Here's Jimi backing Buddy And Stacey on TV show Night Train in 1965, playing Shotgun. Nice dancing. It's 1967, and you're about to hear the mother of all guitar intros. Minds are duly blown. Nice boa. "Watch your ears, watch out for your ears!" Get My Heart Back Together/Hear My Train A Comin' - played sloppy as hell, yet funky as f**k - plus rare on-tour footage and 'happening' visuals. Ten minutes of pure '60s-ness. Woozy. Rare footage of Jimi playing a Zemaitis 12-string acoustic. A rare but classic colour-footage interview. Then Jimi plays Izabella. Nice shirt. 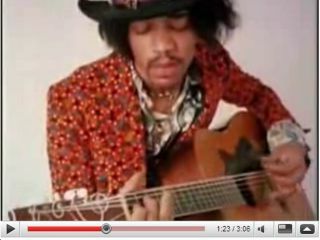 He might be doin' it for the ladies in this clip, but this is proof Hendrix could play acoustic blues like a badass. The man sacked from Guns N' Roses for being too weird - are you sure, Axl? - does his KFC-headed mad thang on a cover of Stone Free. Roomful Of Mirrors covered by… The Pretenders? The Pretenders were good. But this is possibly a bad idea. And still the guitarists argue: who's better? Maybe they were both good?! You'll see what we mean. Derivative, but also very clever. Purple Haze murdered by a 'comedian' on the uke. Led Zeppelin aren't spared either. No, it's not rude. It's just bizarre. And funny. Is this some of the best of Jimi on YouTube? Or have you got better?